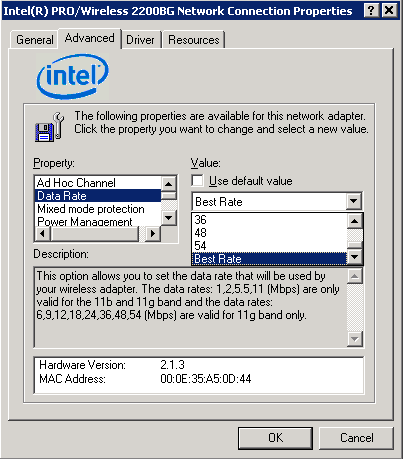 How do I determine the capabilities of my wireless network adapter? Figuring out the speed capability of your wireless network card may not be obvious. 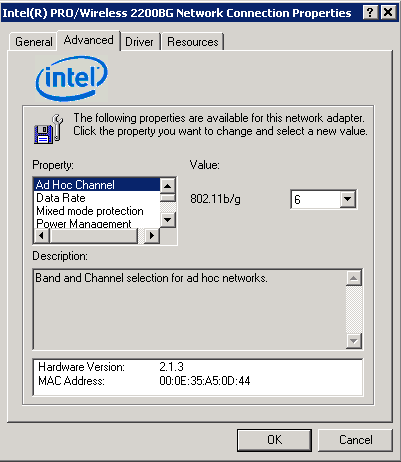 Using Windows you can examine the wireless card's properties. I have a Linksys wireless router, model number WRTP54G, offering 54MBps. I have a Dell Inspiron 510m laptop which has built-in wireless capability, but I want to find out the speed of the wireless laptop card so as to know if that speed matches the 54MBps of my router and thus get the best out of it by having a wireless laptop card that runs at the same or better speed. Can you tell me please how I can find out the speed of this, and if it is actually beneficial to have them both at the same rate? The quickest way, of course, is to look at the paperwork that came with your Dell. They're very good about describing the capabilities of things like network cards as they enumerate the features installed on your machine. But, of course, that's not an option for everyone. Fortunately there's a relatively quick way to check for what you need. 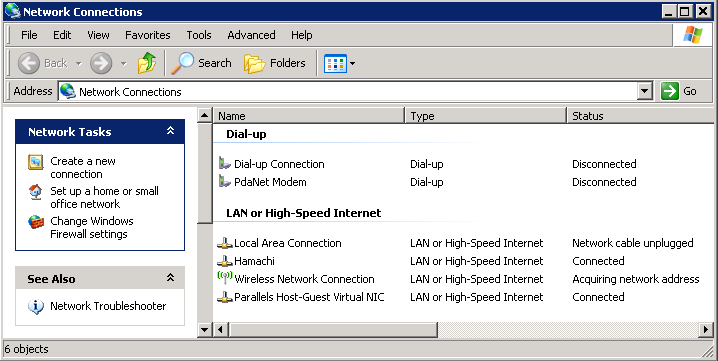 Now, this dialog may look a little different depending on your specific network card. However almost all will have an entry under the "Property:" setting that's labeled "Data Rate", "Speed" or something similar that will expose the speed capabilities of your network card and driver. Click on that. As you can see, my card is capable of 54mbs. There's no need to change anything. The default or current setting should typically be correct. Just hit the ESC key, or click on Cancel to close everything back up. The important point here is that this approach allows you investigate the capabilities of your network card, wireless or otherwise. If you don't see the 54mbs listed, or 801.11g isn't an option, then your card may simply not support the higher speed connection. "It may not make that much difference if your wireless is 11mbs or 54mbs if the internet connection is limited to, say, 768k DSL download speeds." Now... is it worth it to make sure that everything's at 54mbs? First, be aware that you may not experience the full nearly 5x speed increase if you do switch from the 11mbs 802.11b to 54mbs 802.11g standard. My own experience is that the actual speed is sensitive to both distance and other electrical interference. I got about a 3x speed improvement, even though all the equipment is connecting at 54mbs. It also depends on what you're doing. If you're copying large files between machines, you may notice the difference. If, however, you're simply surfing the internet there won't be much change since it's more likely that your internet connection, and not your wireless, is the slower choke point. It may not make that much difference if your wireless is 11mbs or 54mbs if the internet connection is limited to, say, 768k DSL download speeds. There's certainly no harm in having a mixed environment. It's quite ok to have some wireless operating at 11mbs with equipment that's capable of handling more. In most cases, you'll simply be limited to the slower speed. And as I said, whether or not you'll even notice, depends entirely on what you're doing. Wireless Encryption: do I need it? Wireless Encryption is somewhat mysterious. 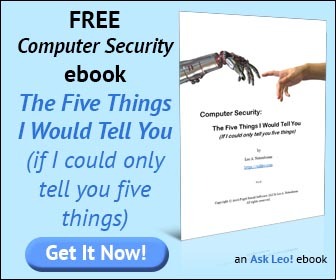 Wireless encryption is something you likely need to keep your network, and your data, secure. 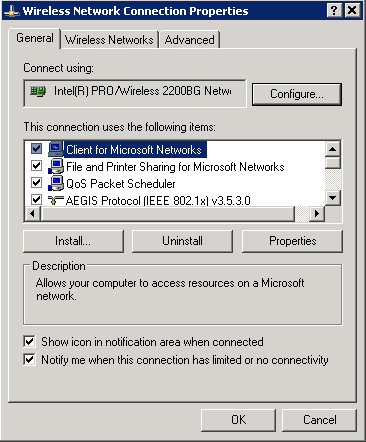 How do I connect my desktop to the nearby wireless internet WiFi hotspot? Wireless internet in WiFi hotspots makes for a convenient connection. To connect to the wireless internet you need proximity, a little hardware and permission. Wireless Networking It's not quite "wireless networking for dummies" but here you'll find a wide range of questions and answers covering things from setting up a home wireless network to wireless routers, what to do at free wifi locations and everything in between. Thanks for the clear answer, (the graphics really helped). Seemingly my broadband operator is offering a download speed of 3Mb, so I have set my wireless adaptor to the max, 54Mbps, and await to see if that makes any difference. Very helpful, Thanks. It's a start... up here in BC Canada are many new WISPs started with volunteers on shoestring govt grant budgets amd "winging it" it at the so-called "Last Mile" outpost installations. Up and running & trying to enducate newbie broadband users, some of whom expect vast MB speeds. I did not put in 802.11 sys but proprietary 5.8 GHz & 900 MHz, so we are dealing with wireless cpe as in the article as well as radio-ODU box-PC setups. I will use this info for testing and maybe find out more on why the Dell PCs & LTs run 1/2 to 1/3 slower than my Acer LT. If you have more advice on wireless troubleshooting, especially for speed issues, for this rapidly expanding type of network, there are a lot of us up here who will be grateful. thanks for the help, it says on my acer that the capabilities are 1.1mbsp, is there any software that i can download hat could make it faster?